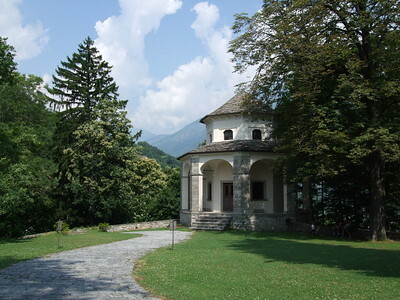 The Sacri Monti of Piedmont and Lombardy are groups of chapels and other architectural features created in the late 16th and 17th centuries and dedicated to different aspects of the Christian faith. In addition to their symbolic spiritual meaning, they are of great beauty by virtue of the skill with which they have been integrated into the surrounding natural landscape of hills, forests and lakes. They also house much important artistic material in the form of wall paintings and statuary. For our drive back from the Swiss lakes to Milan Malpensa airport I had puzzled out a route via the Centovalli and Domodossola. This is a lovely drive, twisting and turning but nothing too bad. About half way we were perplexed by the sight of an enormous church complex: the Sanctuary of the Madonna del Sangue in Re. It was built in 1894 for the 400th anniversary of the 'miracle of the blood'. Wow! So exuberant that it almost looks like an orthodox monastic complex. Domodossola turned out to be quite a large city. Nowhere could we find signs pointing to 'Sacri Monte' or 'Calvaria'. We had to get out of the car in the city center and ask around and look at the city maps posted there. We finally found the Sacri Monti located next to the main road to Milan, beyond the Domodossola town borders. From there it is signposted (if you look well enough, the signs are very small). Of course a Calvary has to be located uphill. I left my mother, who refused to go on via the tiny winding roads, at the foot of the hill. 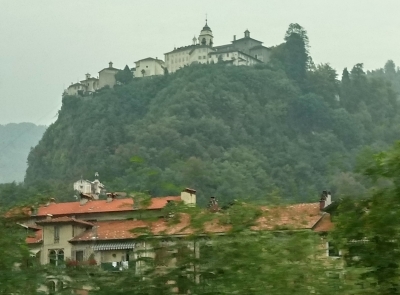 I sped up in the car, giving new meaning to the term 'ticking off WHS': I didn't want to leave my mother for too long by the side of the road, but also just had to grasp the feel of The Sacro Monte and Calvary of Domodossola. It's a large complex, even a bus full of tourists or pilgrims had arrived. I quickly did my rounds, enjoying the location with Alpine views and checking out the chapels, church and remains of a castle. I wasn't as moved here as with the other two Calvaries that I have visited in Slovakia and Poland, but that could have been provoked by the rush I was in. This site in Domodossola is certainly worth a visit. Like other reviewers I was so impressed with Sacro Monte of Varese that I had been seeking opportunity to visit the Sacro Monte of Varallo, the first and most important of the 9 Sacri Monti. Between checking out the new production of Oedipus at the Teatro Olimpico in Palladian Vicenza and the new World Heritage Site of Ivrea this opportunity has finally come for me. There used to be a railway to Varallo, but today the only way to get there by public transportation is by bus, so I took a bus for 90 min. from Novara to Varallo and from Varallo to Vercelli on the way back. From the bus station in Varallo I walked for a few km to the station (45°49'04.0"N 8°15'11.5"E) of cable car, which took me to the top of the Sacro Monte and closer to Heaven in just a few minutes. Varallo is situated in the beautiful Valsesia, a valley created by the Sesia River, which originates in the nearby massif of Monte Rosa, the highest mountain in Switzerland. So at the top of the Sacro Monte I realized that it was in such a mountainous area. Unlike in Varese where 14 chapels and the Sanctuary are arranged basically from the bottom to the top of the hill, this one in Varallo has whopping 45 chapels and the Sanctuary along a path that meanders on top of the hill. This Sacro Monte was the prototype and inspired all the other 8 Sacri Monti. The Calvary here is much more elaborate than in Varese. 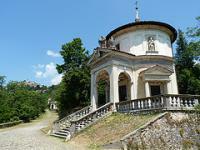 So I would say if you were to visit just one Sacro Monte, you might want to consider this one. I stayed overnight in Varallo, and the following day I took a bus for another hour further into the valley all the way to the ski resort (in winter) of Alagna, part of the Monte Rosa ski area. My wife and I visited two of the Sacri Monti in September 2017. Staying near Lake Como, we decided to visit first Varese and secondly Ossuccio. Unfortunately we found the site at Varese to be a total disappointment, since you can basically drive to the top and it's just a confused jumble of uninspired buildings. Ossuccio, however, was the total opposite. You have to park near the base of the mountain and do a long walk up the path, beside all of the chapels before reaching the top with its impressive Baroque sanctuary and incredible views back over Lake Como. It gives you a really great understanding of what the Sacri Monti concept was all about, and why it was so important to Italians of the time. I'd strongly recommend prioritising a visit to Ossuccio if you want an authentic Sacri Monti experience. I visited the Sacro Monte of Varese, one of the 9 "Sacri Monti of Piedmont and Lombardy" on Feb.6. I took a bus Linea C from the major intersection by the two inter-connected train stations and the bus station of Varese and then got off at the Prima Cappella (First Chapel). Bought the bus ticket at the kiosk at the intersection. It was snowing, but I walked up the hill following the Chapel 1 through 14 and then to the Sanctuary of Santa Maria del Monte, the centerpiece of the Sacro Monte of Varese. This was the highlight of my one week trip to Milano and Zurich. Then I took the bus back from the piazza behind the Sanctuary to the center of Varese, changing bus at the Prima Cappella. I visited the Sacromonte of Ossuccio close to Como but only for a short visit in 2012. It wasn't the best Sacromonte from the list although still interesting to visit. In July 2013 I visited the Sacromonte of Campo dei Fiori outside Varese. Maybe it was the gorgeous weather that helped or perhaps the pristine condition of the 14 chapels and the sanctuary, however the experience was really mind-boggling. Like others, I wasn't really sure what to expect and mistakenly thought that this WHS was yet another list of churches or chapels. However, the Sacri Monti are really unique and not well-known. I compared my experience in Varese's Sacromonte to the experience in Lumbini, Nepal : a spiritual place with a conglomeration of several religious sites. Positively surprised and really worthwhile visit. Of the eight sites that I visited, there were few similarities. Most had artistic and colourful dioramas depicting scenes on different Biblical themes. Varese - I reached by bus C from the station to the sanctuary and the shrines of the Sacro Monte. During my trip to the lakes north of Milan I visited Ossuccio near the town of Como (not far from Tessin in Switzerland either). This sacro monte is mostly noted for its view watching over Lago di Como and the surrounding valley. The chappels themselves were a bit disappointing mainly after seeing so many great churches along the way. The concept of a sacro monte was interesting though as it seemed exotic and somehow non-European. I have visited once the beautiful sanctuary of Sacro Monte ('Sacred Mount') of the Rosary near Varese, one of the nine of the regions of Piedmont and Lombardy, forming this WHS. It was an important place of pilgrimage to the headquarters of the eremitic order of Romite Ambrosiane since 1474 and was begun in 1604, on the initiative of the Capuchin friar Giambattista Aguggiari, with the 2 kilometres long steep and winding paved sacred path (that covers a difference in height of about 300 metres), that represents the Mysteries of the Rosary. Thanks to many donations it was constructed very quickly and thirteen chapels were already built in 1623 and the other two were completed by 1698; they are divided in three groups of five, as in the Rosary. 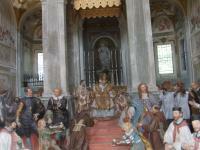 Every chapel, well or fountain and also their decoration of sculptures and frescoes, made with strongly educational purposes and realism by local Baroque artists, are different from the others. The main buildings on the path (that has also panoramic terraces, widenings for pauses of the processions and wells for the pilgrims) are: Church of the Virgin (not yet part of the sacred path because it is a sort of introduction to it), Gate of the Rosary, Fountain of the Samaritan, Chapels of the Annunciation, of the Visitation, of the Nativity (there is a painting of 1983 by the famous Italian painter Renato Guttuso on a Baroque fresco in bad state of conservation on its wall), of the Presentation at the Temple, of the Disputation of the Doctors, Arch of Saint Charles, 2nd fountain, Chapel of the Prayer in the Olive Garden, Romites' Cave, Chapels of the Flagellation, of the Coronation of Thorns, of the Ascent to the Calvary, of the Crucifixion, Arch of Saint Ambrose, 3rd fountain, Chapels of the Resurrection, of the Ascension of Jesus to the Heaven, of the Descent of the Holy Spirit, of the Assumption of Mary in the Heaven, Fountain of Moses (optical end of the path, built between 1803 and 1817) and the Sanctuary of Saint Mary of the Mount, on the top of the mountain, containing the last chapel, of the Coronation of Mary. The sanctuary, built in 1474 on an older and smaller church of the 11th century, is entirely decorated with frescos and contains a nice painting of the 14th century and a nice altar. Around it there is the nice small village of Santa Maria del Monte, with narrow streets and nice houses. I liked very much the Sacro Monte because of its originality and of the monumentality and decorations of buildings that normally have much smaller dimensions (the chapels as isolated buildings). 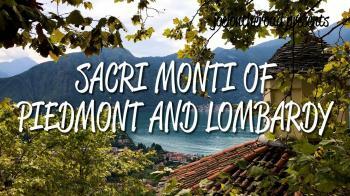 It is worth of visit if you are in Lombardy and justifies its inscription on the WHS, but I think that with the nine Italian Sacri Monti could be inscribed also the two in southern Switzerland (of Locarno and Brissago). The complex has a high degree of authenticity, but there are some modern villas close to the path and in the village, and the monumental buildings, apart from some frescoes, are in a very good state of conservation, but the houses of the village often need a restoration. You can visit only the church inside: the chapels of the path are closed but you can see the interiors from their windows outside and press some buttons to switch on the inner illumination. It is easy to reach Varese by taking the highway A8 that begins in Milan and finishes here. To go to the Sacro Monte you have to take the road SP62 and from there other minor streets. You can reach the top of the mount and park there or leave the car near the beginning of the sacred path or near a close bus station, where are buses that bring you to the funicular railway that reaches the top of the mount. Apart from the WHS, in the town of Varese you can visit the huge Baroque palace Estense with its park or the Cathedral with its Romanesque baptistery.